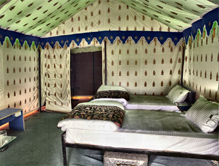 Tendering high quality accommodation and genuine service, Gulmarg Meadows is one of the best luxury hotels in Gulmarg. The hotel offers personalized service, lip-smacking delicacies, world facilities and warm hospitality to make your stay pleasurable. Being a 4 star hotel; it is located at a distance of 70 km from Srinagar International Airport and 56 km from railway station. 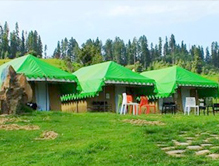 You will feel like home at Gulmar Meadows during the trip to Gulmarg. The buzzing bees, the wonders of nature, beautiful trees and the tweeting of birds make it the best destination to spend a night with dear ones. Accommodation It has 10 comfy tents, each including newspaper, electronic safe, independent verandah, and complimentary bottled water. The hotel also provides 24 hour room service. With its perfect setting, authentic service and maximum comfort, Gulmarg Meadows is the ideal destination for the travelers to Gulmarg. There is a spa center for all those looking for some peace in the beautiful settings. Dining The restaurant serves a variety of culinary options. From Indian, Chinese to continental delicacies, all of them are served with mind-blowing presentation to entice the guests.